Berlin, 2014. The Anthropocene Working Group (“AWG,” of which I am a member) was convening for the first time to deliberate the proposal to formalize a new geological time unit in Earth’s history. This was personal to me, because I had been in Berlin in 1961 when the wall went up and I was there again in 1989 when it came down. I knew the Anthropocene was a significant idea, a “big” idea, and so it seemed right to be in Berlin. More so than I could possibly have imagined. And I would discover that the Anthropocene meant so much more to so many others. But I need to take you back to 2011, when I and a handful of geologists organized a meeting at the Geological Society of London on the Anthropocene. Paul Crutzen was to deliver the keynote. Crutzen is the Nobel Laureate who had declared a decade earlier that we are no longer living in the Holocene but in (apparently he paused to find a word that would make sense, and he invented one) the Anthropocene! The 2011 meeting was essentially the birthplace of the AWG, and our eloquent leader, Jan Zalasiewicz, a Professor of palaeobiology at the University of Leicester, led the charge in marshalling the arguments and the possible lines of evidence that we would need if the gatekeepers of Earth’s chronology, the International Commission on Stratigraphy, was going to accept the Anthropocene as a formal geological time-unit. We talked of things like the building of dams across the world and the consequent reduction of sediments reaching the ocean, of the world-wide sinking of major river deltas, of plastics and bits of Bakerlite making it to the ocean floor, of nitrates and so-called made-ground that was being slowly buried under new generations of buildings and forming geological strata, of the pending sixth most significant species extinction in the history of the Earth, and the fact that most of Earth’s surface was touched in some way by humans. It was the new geology. It became the new zeitgeist. The Anthropocene landed on the front cover of the Economist, portrayed as an Earth machine, and soon after, Time magazine declared it to be one of the top ten ideas that are changing our lives, declaring that nature is over. (Rest assured, it is not!) The BBC covered the meeting on its news web site and gathered more than 300,000 hits within the first 24 hours. I should have seen the writing on the wall: the Anthropocene did not belong to geologists any more. Next to 2013. I had been invited by the Environmental Political Theory group to deliver a lecture on the geologist’s view of the Anthropocene at their annual meeting, held as part of the Western Political Science Association conference. This was to be one of the more surreal professional meetings I’d ever been to. It must have been written in the stars that when the Anthropocene was placed on the meeting agenda, the venue had to be in a hotel that overlooked the Dolby Theater (where the Oscars get awarded) and at that point where the well-heeled Hollywood Boulevard changes to a rather shabby and sad street as it heads down to the infamous location of Hollywood & Vine. 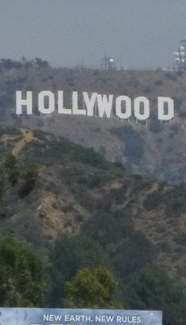 And to complete the irony, as I waited for events to begin, I could see out of our 8th floor window, in large white and slightly off kiltered letters, HOLLYWOOD. I was deep in Anthropocene territory. My lecture came first, and in 15 or so minutes I explained the concept of the Anthropocene. Notice the definite article, for there was to my mind only one concept of the Anthropocene. It is a geological time-unit, manifest by a myriad of things that would, in all likelihood, one day be preserved in the rock record of Earth’s history. These things were all around us. They were all the things we’d talked of in London and to which we’d now added nano particles, molecules that only humans were making, synthetic “rocks” (cell phones and batteries), and not so far away, the remnants of less visible markers, radionuclides from the atomic bomb testing program. These things were slowly making their way down to the ocean. They may get beaten up along the way, but they would retain a human signature; none of these things was being made by so-called natural processes. To this geologist, the Anthropocene was quite simple. But I was to be shaken out of my comfort zone during the presentations that followed. There seemed to be more than one Anthropocene after all, or at least, the Anthropocene seemed to mean something quite different to this group of scholars. Here was the Anthropocene in the context of political theory, in terms of the often tacit relationship between humans and nature, the role of social justice and political systems. This was a language and a mode of intellectual engagement that was difficult for me on at least two counts. One, because I was not (as is said) lettered in political theory, and the language and concepts were dazzlingly new. And two, because the discussion was, to my ears, everything that a scientist is taught not to be: subjective and full of value. This is not intended to disparage my new colleagues. If anything, it was a wake-up call for me: there was more than one way to examine a “thing” that had until then seemed entirely scientific. The lesson was important. The Anthropocene did not belong to geologists alone. And the Anthropocene was clearly not simple. And now we’re back in Berlin. The AWG was meeting in the iconic Haus der Kulturen der Welt (HKW), a showcase of modern American architecture, the place where President John F. Kennedy’s famously declared himself a Berliner, and now the place where the humanities would witness science changing the pages of not just human history, but of Earth history. 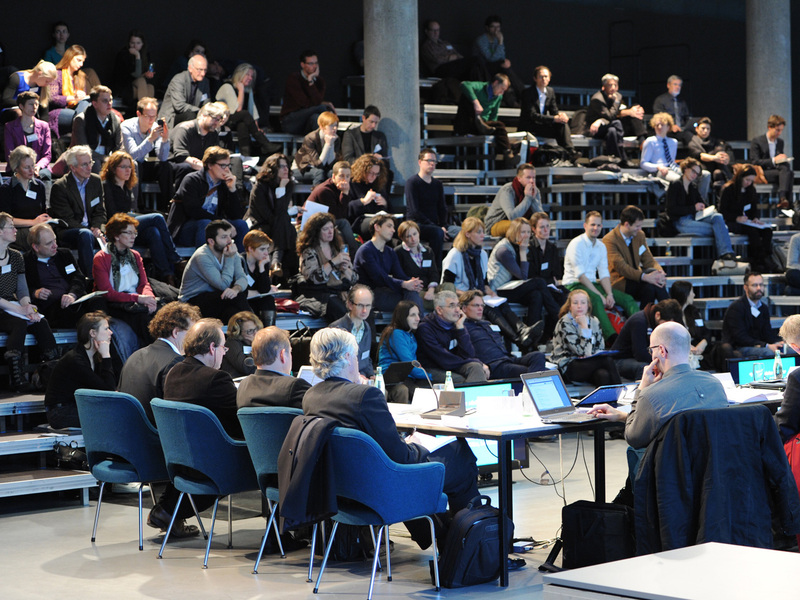 At the invitation of the Anthropocene Project, an inspiring collaboration of humanists led by the Deutsches Museum and hosted by the HKW, the AWG was to have its formal proceedings documented by an array of cameras and eager young students of architecture (architecture?) asking us about our individual responses to their installation of art pieces that celebrated or marked in some way the Anthropocene. This was to be a rare glimpse of science at work, the real-time processing of Earth’s history. We were to be a captured historic moment. The theatre had been reworked to have three large tables scattered across the auditorium, each to hold a debating pair (one scientist, one humanist) to debate the Anthropocene. The audience could tune into any of the three debates through a set of headphones. Take the earphones off and the space was filled with quiet, unintelligible murmurings. But tune in and it was a vitriolic cacophony that none of us had anticipated. This was different from the considered deliberations in Hollywood and certainly contrasted our own typically quiet process of deliberation. The views and opinions I heard here were more startling, more visceral, and more divorced from my utopian use of reason. In an evening performance that was a loosely scripted mixture of various of us and various humanities scholars, there was an overwhelming sense that the Anthropocene was being feared, that it was being seen as the arrogance of man and the end of humanity. Later that evening, I tried to assure one of our humanists that the Anthropocene said nothing about the end of humanity. I was clearly hanging on to the idea that we (geologists) were the guardians of the Anthropocene, and if I could just make it clear that we never meant to associate it with the end of humanity, all would be well. But I am a slow learner, and my new friend was not at all convinced. And to be fair, I left the conversation wondering if this person wanted to be convinced. The Anthropocene had become more than a potential geological time-unit. It was, as my experience at the WPSA meeting should have taught me, a concept with deep and varied meanings. Whether this was or is a good thing would take a while for me to understand. For me, the Anthropocene was not an intrinsically bad thing. It just was, or more precisely, it just is. The day before we met in the HKW, our hosts took us to the highest hill in Berlin, the Teufelsberg, or Devil’s tower. It was entirely man-made and covered in forest. The debris of war-time bombing raids had been trucked here to cover a Nazi military training camp that had been too difficult to demolish, and in turn the US National Security Agency built a now derelict listening station on its top. The surrounding woodlands were reclaiming their space, and the buildings were being consumed by fresh green growth. And yet humans were not absent, as the space was also used by young artists who had chosen an alternative way of living. Their brazen art covered every surface of the dilapidated complex. It was brilliant. It was the Anthropocene in so many ways. As I write this in 2018, the AWG continues to assemble the evidence, piece by piece and objectively as possible (here are the plastics, the biology, and the Earth system). There is healthy division of opinion among our members, and there is skepticsim among the geological community. To many of us, whether the Anthropocene is formalized or not, it exists. Regardless of when it began, it has begun. Perhaps the value that geologists can bring to the Anthropocene is our perspective of deep time, which might help reign in some of the cataclysmic interpretations of the Anthropocene. Or perhaps that same consideration of deep time is blocking our ability to understand the Anthropocene from the perspective of others. For this geologist at least, its value is that it has drawn many of us (writ large) to the same table. Scholars across the sciences and humanities may not yet share a common language, but we now share a common word, which seems a good start. Postscript. Climate change is often portrayed as the signature feature of the Anthropocene. In a recent flight across southern Greenland, Zev Trachtenberg eloquently describes the vision of loss visible from 35,000 feet, a vision that many of us have probably shared. I’ve posted a comment on Zev’s post that places climate change in its Anthropocene context. You might find it surprising. This entry was posted in Perceiving the Anthropocene, Reflections and tagged Anthropocene, Anthropocene Working Group, geology, humanities, Teufelsberg. Bookmark the permalink.